Going on vacation should be a relaxing and enjoyable time. After all, you get to see new and exciting places, disconnect from the mundane of everyday life, and maybe experience new things. Unfortunately, it’s all too easy to stand out as a tourist and let our guards down. When you do, you make yourself the perfect prey to pickpockets and thieves. Even worse, is that we often realize this after the fact, after the damage is done and our finances and identity have been compromised. Thankfully, there are preventative measures you can take to protect your money and personal information. Instead of having your trip ruined, try these eight ways to protect your money when traveling. Before leaving on vacation anywhere, it’s always a good idea to alert your bank and credit card companies beforehand. Let them know where you’re going and how long you’ll be gone for. This way, the banks won’t deem any purchases you make while traveling as “unusual activity”. When this happens, your cards will be frozen and you might find yourself without money. Moreover, it may make your bank jump into action quicker should your cards get stolen or lost while you’re gone. During your normal, everyday activities, you likely carry an array of items in your wallet. You probably have multiple credit and debit cards, cash, and multiple forms of ID. However, if you’ll be traveling, it’s a good idea to travel a little more lightly. Bring only the forms of currency you know you’ll actually use and be sure to leave any document that has your social security number on it at home. If you do bring your debit card, it may also be a good idea to store it safely in another spot. If that gets stolen, your account is highly compromised. Before heading off on your trip, make sure make copies of all your important documents. Have extras of your driver’s license, passport, and even your credit and debit cards. It may also be a good idea to write down your account number and the contact information for your bank. Leave a copy of these items with a friend or family member and email a set to yourself. That way, if something does happen, you’ll be able to prove your identity and quickly cancel anything that was stolen. While you’d normally keep all your currency and identification in one place, you may want to think twice when you’re traveling. This is especially true when it comes to cash. Store some cash in your wallet and keep the rest in a safe place, think the safe in your hotel room. That way if you do get pick pocketed, everything won’t be lost. That being said, however, be sure not to leave any cash in your checked luggage. If it gets lost, you’ll be out that amount. If you find yourself in need of cash while traveling, it’s important to make yourself wary of where you get it. Steer clear of stand-alone ATMs that aren’t located in or near a bank, as they’re more easily surveyed and tampered with. Furthermore, always be sure to carefully examine the ATM as well. Make sure nothing looks loose, altered, or broken on the machine. That could be a sign that it’s been tampered with. Your debit card is a direct access to your bank account, which is why it greatly puts you at risk if it’s stolen. Thieves would have immediate access to your account. Plus, it can take a much longer period of time to have your money reimbursed. And you’ll be without access to the account should it be compromised. This is why you should opt to use a credit card instead. 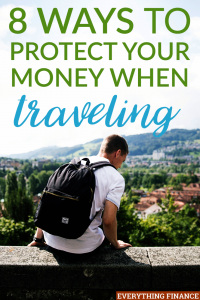 They’re generally safer when traveling since the money won’t immediately be withdrawn from your account, and they tend to have better legal protection as well. This is generally a good idea even for every day monitoring to protect your money. However, if you haven’t signed up to receive alerts on your account, definitely do so before traveling. By doing so, you’ll be alerted via text or email of irregular activity or when a transaction has been made that’s higher than a certain amount. You’ll be able to keep a watchful eye on your account and be able to immediately alert the bank should fraudulent activity take place. All in all, account alerts can help you drastically keep any possible financial damage at bay. Whenever you’re traveling, always err on the side of caution. Don’t put your wallet in an obvious and easily obtainable place, such as your back pocket or the front pocket of your purse. It may be a good idea to carry a money belt in lieu of a wallet or purse to ensure your money’s safety. Always make sure it’s somewhere a thief couldn’t easily get to it. Moreover, if you do leave items in your hotel room, be careful as to where you keep them. Don’t leave all your cash and cards in one spot or in the same pocket of your bag. Lock it up in the safe or find a better place to put it. Or, you could opt to divide it up and carry it discretely on your body. It may seem like a hassle to take a lot of precautions when traveling, but you’ll be glad you did. While having your information or financial materials stolen never seems like it’ll happen to you, it’s unfortunately all too easy for some thieves, and in an instant all your valuables could be gone. Don’t let yourself fall victim to a pickpocket. Take the proper precautions and always be aware of your surroundings. By doing so, you’ll put your mind at ease and be able to fully enjoy your vacation. Have you ever fallen prey to a thief while traveling? What are some of the additional precautions you take to protect your money when on vacation?